More video games released in 2018 than probably any year in history. Below you'll find a dozen great ones that you might have overlooked. It has been one hell of a year for indie games, as evidenced by our 2018 Game of the Year list. Nine out of the ten entries on that list were indies, which almost negates the need for us to do our traditional “Games You Missed” list as well. Almost, but not quite. Our Game of the Year list covered the best of the best, but there are still a bunch of smaller experiences worth highlighting I think—games like Timespinners, Graveyard Keeper, Exapunks, and...well, read on to find out. Below you’ll find a selection of games I enjoyed this year but didn’t get around to discussing as much. Hopefully there’s something you missed, rescued from the void at the last second before we roll into 2019. Of all the games we didn’t get around to reviewing this year (and there were a lot), Unavowed ($15 on Humble) is the one I feel worst about. A spiritual successor to Dave Gilbert’s acclaimed Blackwell series, Unavowed takes place in the same magical-realism version of New York City. It’s far more ambitious than Blackwell though. Blackwell is fantastic, don’t get me wrong, but all five are pretty traditional adventure games. Unavowed tries to fold in BioWare-style elements into its much smaller framework though, with various character backstories to choose from as well as companion characters—each of which comes with not just unique dialogue, but unique puzzle solutions as well. From a design standpoint, it’s a fascinating experiment. And because it’s a Dave Gilbert game, Unavowed is every bit as well-written as you’d expect after the Blackwell series. You really shouldn’t miss this one. Do you like Castlevania: Symphony of the Night? Because let me tell you, Timespinner ($20 on Humble) is straight-up Symphony of the Night. The story is different, the setting is different, the items are different, and you’ll find no “miserable pile of secrets” in Timespinner. But every once in a while there’s a game that pushes past homage straight into spiritual successor territory, and Timespinner is one of them. It meticulously recreates the look and feel of Symphony of the Night, from the way your first weapon feels like a whip to the “On/Off” toggle switches for various abilities. 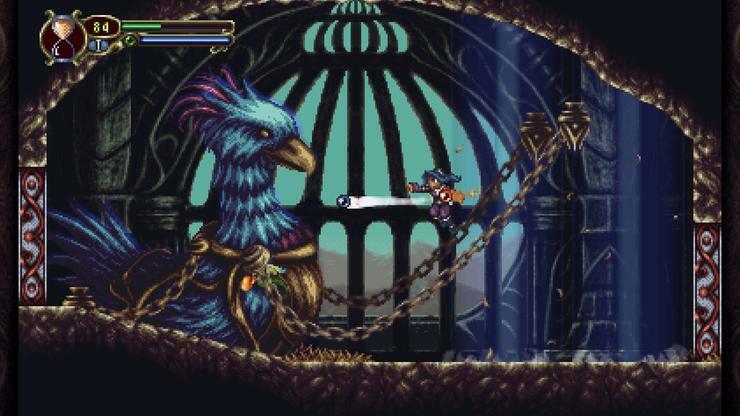 The problem with these sorts of slavish tributes is you could always simply play the original instead—but if you’ve done Symphony of the Night to death over the last two decades, Timespinner is a way to recapture some of that original experience. Oh, and you’re a frog, in case that wasn’t clear. The Haunted Island, a Frog Detective Game ($5 on Steam) is a twee little adventure with a cute low-poly art style and snappy writing. There’s not much challenge to it, but that’s not really the point. It’s funny and off-kilter, with a memorable cast and some equally memorable moments packed into its short hour-ish run time. That might not make it a good fit for the bang-for-your-buck crowd, but I adored The Haunted Island more than I expected and hope the devs get to make more cases. And hey, it’s always a treat to be able to start and finish a game in a single night these days. If you’re looking for a more serious detective story than Haunted Island, Lamplight City ($15 on Humble)is worth investigating. Created by the developer of the unsettling post-apocalyptic tale Shardlight, Lamplight City promised a detective game without the usual hand-holding—meaning a detective game where you could (and maybe would) screw up. That might sound daunting, but in reality Lamplight City is pretty good at rewarding even the middling detectives among us. Maybe a little too rewarding, even. Still, there’s a lot to love about an adventure game that rewards diligence and logic, especially one that doesn’t force you through the usual batch of inventory-based puzzles in the process. Like Shardlight prior, there’s a lot of unrealized potential in Lamplight City, but the experimental bits (and the gorgeous pixel art) are well worth overlooking a few flaws. “Shake your body. Sh-shake your body. Shake your body down to the ground. ” One of two remasters on the list this year, Lumines was arguably the best game ever released on the PlayStation Portable. A Tetris-style game, your goal is to match groups of four-or-more colored blocks together to clear them from the board. But Lumines paired its simple concept with thumping music and wild background art, tying all three together into an experience meant to mimic synesthesia. It was incredible in 2004, and now even more incredible in 2018 ($15 on Steam) when played on an enormous TV or computer monitor, with a great sound system to back it up. And if you need more proof of Lumines’s influence, go pick up this year’s PlayStation-exclusive Tetris Effect. Spoiler: It borrows a lot of ideas from Lumines, bringing things full-circle. Maybe you looked at Stardew Valley and thought “This is too pleasant for me.” Or maybe you played Stardew Valley to death, learned all its ins and outs, and now need something fresh. Or maybe you’re just really interested in graveyards. Whatever the case, Graveyard Keeper ($20 on Humble) is the most surprising Stardew Valley successor of 2018—and there have been a lot of Stardew Valley successors this year. Rather than managing the family farm, you’re (as you might expect from the title) in charge of a cemetery...sort of. Billed as “the most inaccurate medieval cemetery management sim of the year,” Graveyard Keeper is layered with supernatural entities, as well as borderline-horrific business opportunities (like selling body parts). It’s a delight though, despite the macabre overtones. Hard to believe I’m putting Guacamelee 2 ($20 on Steam) on a “Games You Might Have Missed” list, but it feels like it came and went with very little fanfare. Perhaps that speaks to how many fantastic indie games released this year, that even a high-profile sequel can get drowned out. Marble It Up ($20 on Steam) is one of those throwback games I didn’t even realize I wanted until it appeared on Steam. I lost entire days of my life to Marble Blast and Marble Blast Ultra back in the day, and Marble It Up is a tone-perfect successor. Your goal is usually as simple as “Get from one end of the course to the other, as fast as possible,” but physics make that more challenging than it sounds. You need to balance forward momentum with precision, leaping over slight gaps or pivoting around hills while keeping your speed up, snagging the occasional power-up to freeze time or give you an extra-high jump. The actual game is pretty short, but a growing selection of community-generated levels available through the Steam Workshop (including many lifted from Marble Blast Ultra) should make this the definitive marble game for years to come. You are a benevolent god. First you give your people rain, to make the deserts fertile. Then you give them an apple tree, to provide food. Then you give them more rain, to make the tree grow—except, oh no, now the whole area is swamp and nothing but poisonous berries grow there. Simmiland ($5 on Steam) is probably the smallest game on this list. It’s a god game, but all your abilities are governed by cards. Playing the “Tree” card grows a tree, “Plant” grows a plant, “Lightning” causes lightning to strike, and so on. But it’s also a game about discovery, where different combinations can net new and interesting results. Playing your “Tree” card in the desert results in a dead tree, for instance, while on fertile ground it means an apple tree—and in the tropics, a palm tree. There’s a surprising amount of depth to Simmiland, and it’s good fun to spend a night poking and prodding at this one in 10-minute chunks. “The King of All Cosmos has really done it. A sky full of stars...we broke it. Yes, we were naughty. Very naughty.” Thus opens Katamari Damacy Reroll ($30 on Steam), remaster of the 2004 classic. If you’ve never experienced Katamari Damacy before: You play as the Prince, tasked with rebuilding the cosmos and replacing all the stars. How, you might ask? You have the katamari, a sticky ball that’s able to accrue mass by rolling over objects. As the ball gets larger, so do the objects you’re allowed to pick up until eventually you’re rolling entire buildings, clouds, and even islands into your katamari. It’s one of the most charming and relaxing experiences of all time, now on PC for the first time ever—and bringing widescreen support, as well as sharper models and textures. I watch a lot of shows about houses on Netflix: Grand Designs,The Great Interior Design Challenge, Amazing Interiors, Escape to the Country, and so on and so forth. I’ve a passing interest in architecture, but mostly I find them incredibly relaxing. House Flipper ($20 on Steam) is that idea in interactive form. You’re presented with a rundown house, then given the tools to fix it. Early missions have you mopping, replacing appliances, and other menial tasks, but soon you’re rich enough to live out your design fantasies—knocking down walls, painting, buying furniture, decorating, and so on. It’s not a perfect experience, with typos and bugs aplenty, but I’ve found it soothing regardless. It’s a familiar ritual to me now: Zachtronics puts out a new programming game, I play it, and after a bit I get completely stuck on a puzzle for days (or weeks) on end, obsessing over it before bed every night. I’m no programmer, after all. I find these puzzlers deeply addictive though and have put unreasonable amounts of hours into the BASIC-themed TIS-100, the hardware-centric Shenzhen I/O, and now the network-themed Exapunks ($20 on Humble). It helps this is the most creative Zachtronics game to-date, meant to mimic the ‘90s hacker scene—or a Hollywood version of it, at least. Programming instructions are delivered to you by way of zines (PDF and printable) while your character tries to fight a virus that literally turns people into computers. Yes, seriously.